Some folks are born with business in their veins. Julia Gordon is one of those people. In the 3rd Grade, when she was 8 years old, Gordon launched a company with her friend. They made “Madonna” bows — lace bows with rhinestones attached — back when the album “Like a Virgin” was larger than life. The company was called Pizzazz Bows With Style. They had business cards, and sold the bows to Lester’s, a children’s store on Long Island. They made money. In high school, Gordon braided hair with beads. For $25 a strand, she made $100 a day. “After school, my answering machine was full,” with people asking for appointments, Gordon says, laughing at the memory. Now the Cobble Hill mom of two runs Hiho Batik, a create-your-own art studio on 5th Avenue in Park Slope, along with her business partner, Robyn Stylman. 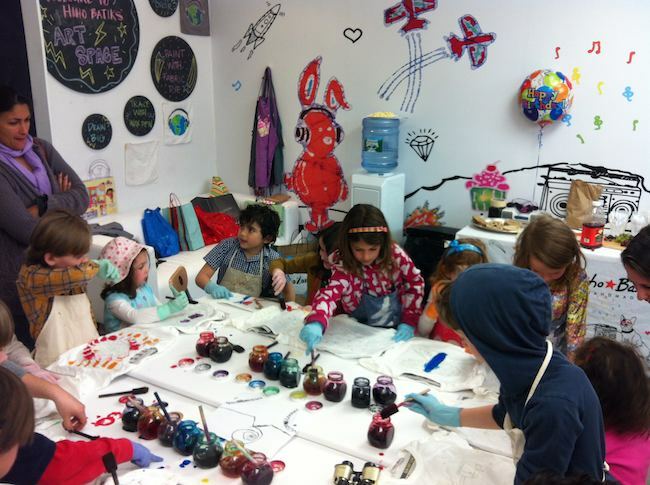 The bright work space is a place for birthday parties and play dates, or where parents can take their kids for hour-long art sessions in which Gordon or her employees teach the craft of batik. Due to popularity, Gordon is now offering batik sessions and hangouts for adults, and with appointments, at the studio in the evenings. (And in fact, some evening sessions are coming up for groups of women who want to batik loungewear for Valentine’s Day). Batik is an ancient art form, with roots in China, India and the East dating back more than 2,000 years. Back then artisans didn’t have electric hot wax pens, as can be found at Gordon’s studio. But the concept was the same – to create original, hand-drawn works of art and clothing using dye and wax. 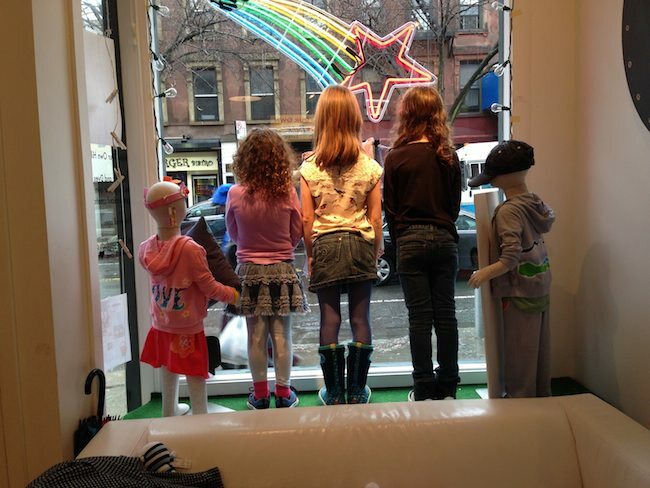 It was a cold, dreary and pouring-rain day in January when I took my 7-year-old daughter and her friend to Gordon’s studio, a cheery place for an icky day. The girls and I headed through the retail shop (offering batik shirts, one-sies, leggings and etc., as well as unusual toys and Brooklyn-designed baby and kids clothes and stuff) back to the art studio. 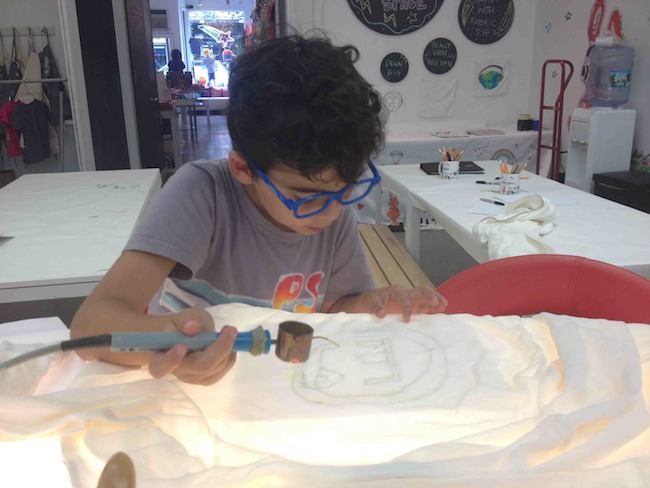 There we stayed, happily, for an hour-and-a-half, making drawings, then tracing them with a hot wax pen onto cloth placed over a white-lighted-table, and then painting the cloth with dies that would stain our creations with color. 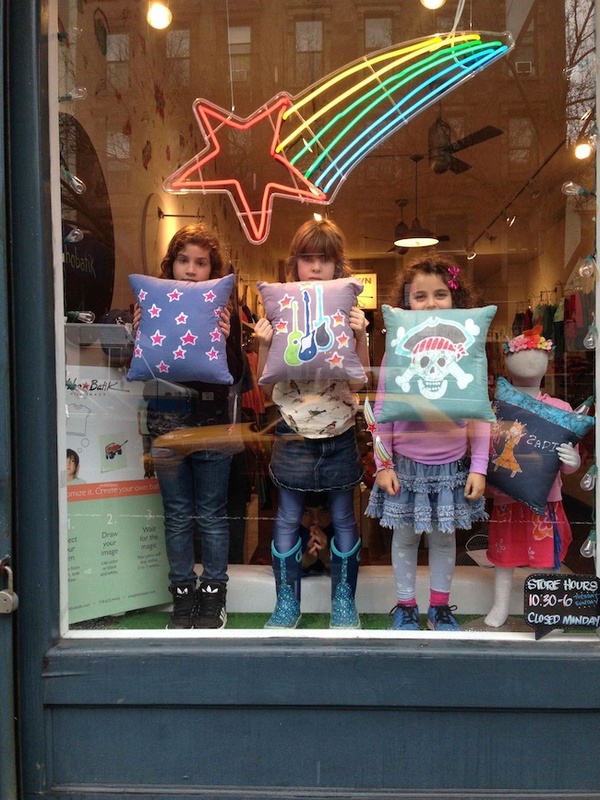 We made a couple small pillows – one each for the girls — and a nice cloth shopping bag for myself. Gordon special orders all of her stock to insure quality, and I loved the soft feel of the cotton pillows. We had a great time. The staff was helpful, they teach well, but they don’t hover, so you can create and hangout. The music is good, ranging from newish indie rock to Bob Marley and the Cure. It was relaxing. Now that I have my Hiho Batik items at home, I’m very glad I went. Because the pillow, and my bag, showcase the adorable artwork of my 7-year-old, whose drawings I hold dear as they become less baby like every day. Gordon is a pro, an old-hat at batik. It started when she was travelling in Africa, and saw some batik scarves, and wanted to learn how to make them. Back at art school in Colorado, she taught herself. She launched a business, designing batik t-shirts for bands in Boulder, and then developing a line of batik children’s clothing that she still sells. After college in Colorado, she moved to Miami, and set up shop in a 1950s gas station in Little Haiti for her wholesale batik line, before opening her first retail batik studio. Hiho Batik is a wonderful outing. There’s a great coffee shop next door. Just down 5th Avenue is the fantastic playground at 5th Avenue and Union Street, in front of the Old Stone House. Walk down Union over the Gowanus and pop, you are in Carroll Gardens. It’s really a nice walk. 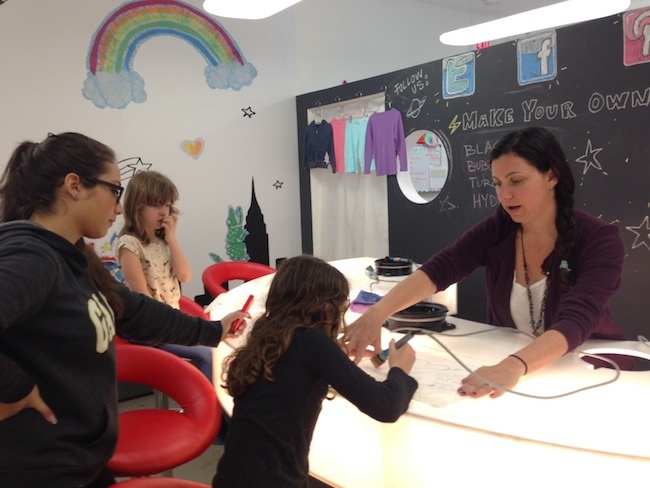 Reserve a two-hour make-it party at $40/person, including hoodies, bags, scarves and long- and short-sleeve t-shirts. Nice idea for baby showers and 40th birthday parties. Wine, cheese and sushi can be arranged. Tell them South Brooklyn Post sent you.